In most cases, CMS DataLife Engine is used to create electronic media and blogs. Due to convenient heading arrangement and news publication tool the system perfectly solves the assigned tasks. Media and blogs always include a lot of images used for creation of news and posts. Large quantity of images can increase the page loading time. Users are accustomed to getting information quickly and such slow performance of a website can do a disservice. Image compression in DataLife Engine will help optimize the webpage. But manual compression takes a lot of time. Using the OptiPic plugin will solve this problem. Plugin for image compression in DataLife Engine involves algorithms allowing to reduce the file size by 50-70% without image quality loss. At first, the user should configure the plug-in in a few clicks. After setting OptiPic in DataLife Engine the image compression will be performed automatically. How can the plug-in for image compression in DataLife Engine be helpful? Webpages will be loaded faster. Visitors will be able to get information promptly, and the search engines will raise the resource while ranking. With OptiPic your blog or media will become user friendly. Image optimization is special processing of a graphic file in order to minimize its size without loss of visual quality. To carry out this procedure, there are a large number of fairly complex algorithms. However, they are all based on the same basis - all the service data there (for example, the name of the program that stores the file, etc.) must be removed from the graphic file, and also, using special programs, merge / smooth similar colors. As a result, we get the same image, which visually has not changed. However, the volume (weight) of this file in bytes will be much less than the original. If this processing is carried out correctly, the image file can be reduced to 98% without losing image quality. This means that the pictures on the pages of the site will be loaded many times faster after the optimization. Better site ranking for search results. It has been proven that website acceleration can improve behavioral factors, as well as increase website conversion (increase sales). The longer the page of the site loads, the fewer customers will be able to perform certain target actions there. If your site on the Internet will not work fast enough, you have every chance to miss your potential income. Acceleration of the online resource will provide an opportunity to improve the conversion and due to this significantly increase revenue and attract more customers. There are no monthly payments. The Internet address (URL) of the compressed images does not change, they will continue to be stored on your site. To connect and use the service, you do not need to have special skills in programming or administration. There are no restrictions on image size in the system. How can optimizing images for DataLife Engine speed up a site? css files with page styles. Such an item as an image occupies most of the entire volume on the site’s pages and is the “heaviest” part of the pages. Reduction (optimization) of images will undoubtedly significantly make it faster to download any online resource. Accordingly, if you change (down) the size of the images, all pages of the site will start loading much faster. Compressing the images on the site will make it possible to reduce their volume to 75-98%, without losing their visual quality. How to get started with OptiPic service for DataLife Engine for image compression? After completing registration, you will receive an email with a link for activating your account. Follow that link. Next on our site enter your personal account Profile > My Sites click the Add Site, button, specify the URL of your site and click Connect Site. After your site is added to the system, go to the Download plugin tab. On your site after that such page should be work http://your-domain.com/optipic.io/index.php. After you upload the plugin to your site, you will need to activate the indexing of the site in the site settings and wait for the OptiPic system to perform the first indexing of your site - it will be done within 24 hours. If you want to speed up the process - manually submit your site for indexing. After the first indexing is completed, the system will show the number of images (the number of gigabytes) that will be found on your site. You can do this on the Compression index and statistics tab. 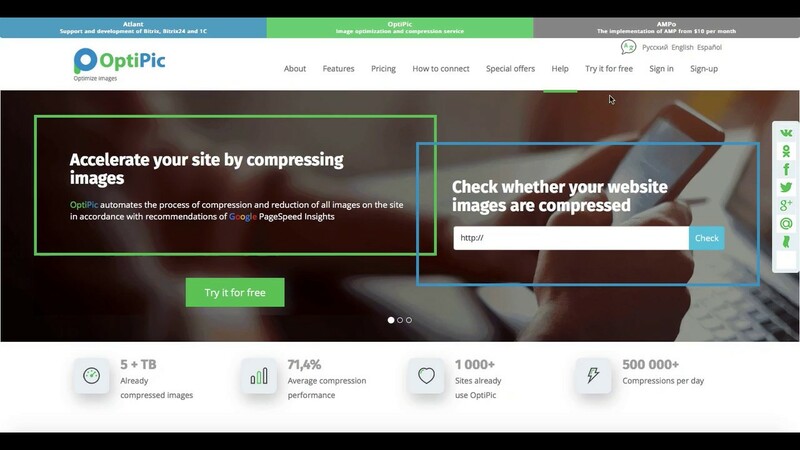 Now when you have the number of images on your site - purchase the package you need and start compression in the site settings. Please wait. The site is being analyzed. Soon you will be redirected to the verification results page. I really like this product! It has all the necessary functions for the appropriate image compression keeping the same image quality and there is no server load. For a user it looks like this – install it and you can forget about it. Google and users enjoy the site’s speed. I do recommend it. Excellent product. It compresses images well and doesn’t worsen their quality. I recommend it. I hesitated before buying this product. Should I try it or not? I shouldn’t have waited. It’s certainly worth it. I used to have 2 GGb of images, now I have only 400 MB of them. It has provided me with almost 90% compression. It has resized all the images which I didn’t feel like doing myself. The settings can be customized. They have great customer support. They respond immediately with all the necessary help. They are said to be planning to upgrade the product with some improved features. To keep it short – I recommend it. Developers, thank you very much! I was pleasantly surprised by this solution. Easy to set up and manage. I've been looking for something like that for a long time. Developers thank you so much !!! Use the purchased package until it is used up. Purchase additional packages if necessary. Try it out Try it out How to choose a package? How to get? How to choose a package? Buy Buy How to choose a package? Image compression accelerates the site performance according to Google PageSpeed Insights. Besides, our experts are willing to accelerate the entire site for you. The process is fully automated. Just connect your site to our service and the system will search for all images and compress them on its own. After compressing the images, they are saved to the exact same file at the same address. Using OptiPic is completely safe and transparent thanks to a set of measures: OWASP, security key, strictly limited set of commands, open source. The service will constantly look for changed and newly added images and put them in the queue for compression. It's easy to connect to any site in PHP. The service supports all known CMS and frameworks, as well as self-designed sites in PHP. Choose whatever is necessary for you: either compressing images without losing in quality or getting the maximum compression of up to 98% but with worse image quality. Set the maximum possible width and height. And the images will be resized proportionally according to the maximum length to the specified sizes. The service works absolutely safely and carefully. When compressing images on the site, their original versions are saved next to the original file. Also you might choose the option of saving it in our Cloud. Having questions about connecting to the site? Free of charge we will help you to integrate! Upon your registration, you will get 10MB on your account. You will also be able to compress images through the web interface a single item at once with no restrictions. The plugin scans the entire website, finds all website images and compresses them afterwards. Plugin control is available directly in the personal account of the service. The compression quality can be adjusted in the plugin settings. Join our groups on VKontakte, Facebook, Google+ and Twitter pages and get +1% discount per each page. Help us to improve our Service! How do you feel about OptiPic? I like the service - I will surely use it! I don’t really understand what the Service is about. Finding the optimal package is easy and free! 3. OptiPic scans the site and finds all the images. The system will tell you how many images were found on your site and suggest the appropriate package. Please note that it would be nice to have more stock on the account, so that new images will be automatically compressed, which will be added later on the site.